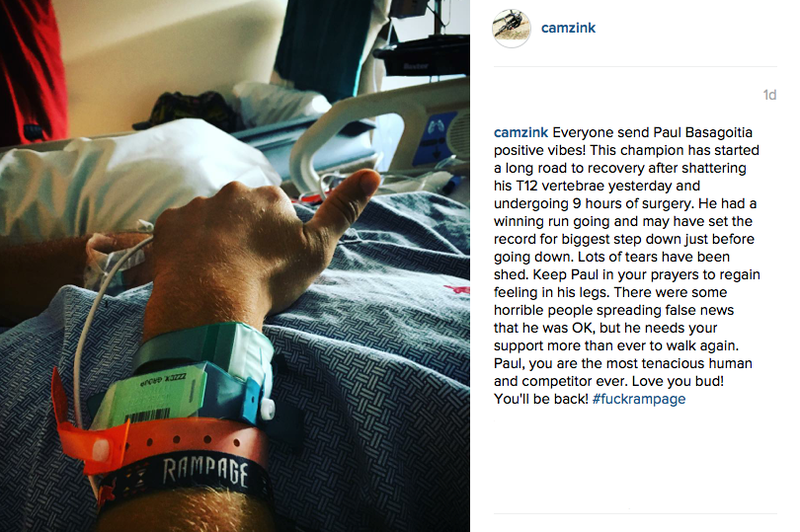 Cam Zink has taken to social media to attack Red Bull Rampage after visiting fellow rider Paul Basagotia in hospital. Zink used the hashtag #fuckrampage to sign off a message that showed a picture of Basagotia giving a thumbs-up from his hospital bed. Basagotia fell off on his first run on Friday’s competition after riding a drop that Zink described as “the record for biggest step down”. He managed to land the drop but was unable to hold onto his squirming bike and ended up breaking his T12 vertebrae. It seems that Zink is unhappy with the risks riders have to take when competing at Rampage, his full message reads: “Everyone send Paul Basagoitia positive vibes! This champion has started a long road to recovery after shattering his T12 vertebrae yesterday and undergoing 9 hours of surgery. He had a winning run going and may have set the record for biggest step down just before going down. Zink’s wife, Amanda, shared his feelings towards Rampage, on her own Instagram she re-posted a message from Deity, one of Zink’s sponsors. It read: “We are glad that Rampage is over. To dig all week in the brutal desert heat and then have to put your life on the line after nearing exhaustion is putting our heroes, friends, family, and ambassadors at risk.